If you’ve installed WordPress before, you may have noticed that the default installation is not SEO-friendly. If you want to have a better search engine ranking, you need to optimize it first then, later on, find ways on how to promote your WordPress website. The good news is, you can enhance your site’s ranking with some simple steps. This tutorial will show you how to make sure your WordPress site is optimized for search engine results. Maybe you’re like one of the people who like to fiddle with new stuff as soon as you get it without reading the manual or a guide first. Be it a smartphone, a laptop, even tools, and software, the first thing you want to do is to personalize it by experimenting with the settings. If that’s the case, make sure you don’t experiment too much. Here’s what you need to know about the WordPress settings and how they affect your site. The first thing you should do is to make sure that the Search Engine Visibility checkbox is unchecked. If your site is already live and you ticked off the “Discourage search engines from indexing this site,” you would lose your search rankings. All your SEO efforts would go to waste, and the effects can’t be undone immediately. What you need to do: Go to Settings > Reading from your WordPress dashboard and make sure you left this unchecked. By default, the URL structure looks like this: ?p=123. In order to optimize your page, your URL should contain the keywords that you want to rank for. You can choose a custom URL structure under the permalink settings. Go to Settings > Permalinks then you can choose from the Common Settings option or set a custom URL structure. What you need to do: Always include the post name in the URL structure that you would like to use. Your title should contain your keyword too. As much as possible place the keyword at the beginning of your title as search engines give more weight with this. The optimal title length is about 50-60 characters. It is important to watch the length of your title so it shows properly on search engines. According to David Ogilvy, “On average, 5x as many people read the headline as read the body copy. When you’ve written your headline, you’ve spent eighty cents out of your dollar.” This means that your titles should be powerful and compelling to entice your visitors to read your content. You can use tools like Headline Analyzer that can help you analyze your title and how to make it impactful to your readers. What you need to do: Use your target keyword in the title and as much as possible, place it at the beginning. Blog graphics not only helps your readers get engaged with your content and reduce your bounce rates. It also helps search engines discover your site by adding your target keyword to the image alt text. But you have to make sure that you use image SEO the right way so you wouldn’t rank for unintended keywords. To improve your search engine ranking, you should add your focus keyword in at least one of your blog images. Another thing to consider is optimizing your images. You can use TinyPNG for image optimization and reduce the file size of your images so they won’t load slowly on your site. You can also use other types of media like videos and gifs to keep your readers engaged. What you need to do: Add at least one media files to every post that you publish. Use proper heading tags on your pages and posts. Remember that you should only use one H1 on your content. Then use H2s on your subheadings and H3 to your H2s subheadings. What you need to do: Add your target keyword to at least one of your headings (H2 or H3). According to a study conducted by Reboot Online, outgoing links have a positive effect on SEO. 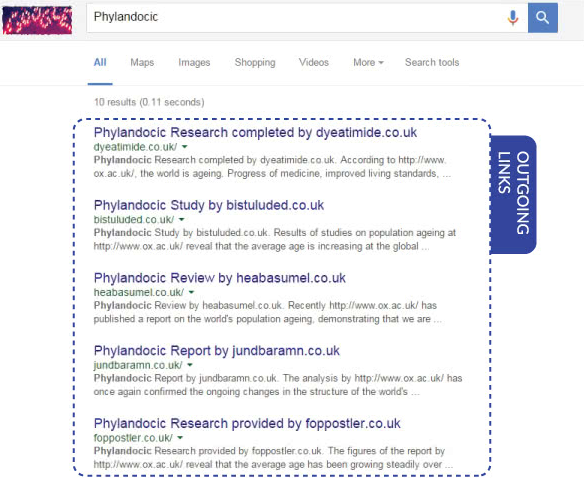 They did an experiment wherein they made up a word–Phylandocic–that has no search results. Then they created 10 sites and published a 300-word article about that word. Half of the sites they created for this experiment linked to three high authority websites while the other half had no outgoing links. The results of this study showed that linking to high authority sites can improve search rankings. Internal linking is the process of linking to another page or post of the same website. Doing this can help increase the ranking potential of your posts. Internal linking also helps your readers engaged and reducing bounce rates. Make sure to link to related articles. 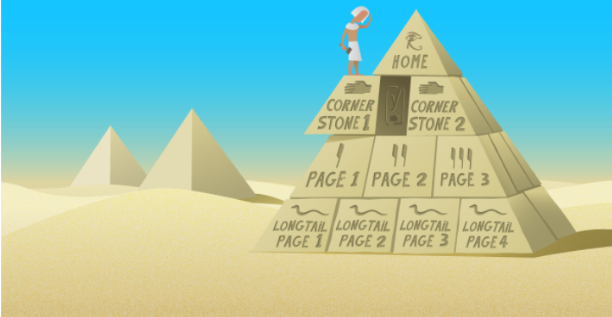 According to Yoast, your link structure should look like a pyramid with the cornerstone articles on top. What you need to do: Add internal links at the beginning of your article to reduce bounce rates. Content experts have opposing views on this. Some say that you should post long content while others say that quality is more important than quantity. But if your goal is to rank high on search engines, you should write an article with at least 1,500 words. What you need to do: Publish articles with a minimum word count of 1,500 words. You can update them later to stay relevant and make them longer. Adding social sharing buttons will give you an opportunity to get more traffic to your posts or pages. Aside from this, user behavior can affect the search ranking of a certain page. When your post gets a lot of shares in social media channels, it signals Google that your content is valuable. Search engines, like Google, rewards sites that add value to the readers. What you need to do: Add social media sharing buttons that can easily be seen by your readers. Page speed is one of the known ranking factors that Google uses. You need to make sure that the loading speed of your WordPress site is at least the average. You can use tools like Google’s PageSpeed Insights to analyze your site’s speed and give you actionable guides on how to make your website faster. Choose a reliable managed WordPress hosting provider – Consider switching to a web hosting provider that specializes in WordPress. They manage your site’s security, speed, backups, scalability, and WordPress updates among others. Use a Content Delivery Network (CDN) – CDN makes your site faster by delivering cached content from a server that is closest to the end user. It doesn’t only improve your site’s SEO but the user experience as well. Use less plugins – One of the reasons why WordPress is preferred by a lot of users is they don’t have to learn advanced coding skills to manage their sites. There’s a saying that goes “There’s a plugin for that” in the WP community. This means that if you want to customize your site and add functionalities, you can likely find a plugin that can do the job. But using too many plugins can slow down your WordPress site. It is recommended to install necessary plugins only for your site. What you need to do: Check your site’s loading speed and optimize the speed of your website. More than half of the internet users access the web using their mobile phones. 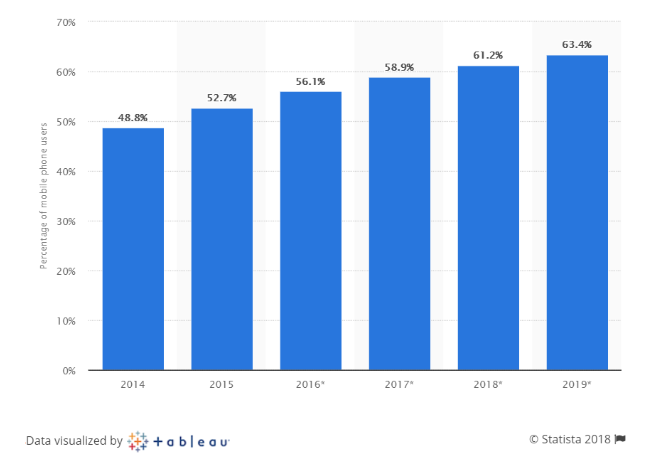 The graph below shows a steady increase of mobile internet penetration globally from 2014 to 2019. According to Statista, in 2020, the number of smartphone users worldwide is projected to reach 2.87 billion, up from 2.1 billion in 2016. This is one of the reasons why you need to optimize your website for mobile devices as Google penalizes websites that are not mobile-friendly. The principal and Google approved way to create a website that is accessible to mobile users is responsive design. By using WordPress, there’s a big chance that your website is already responsive to mobile screens. You can check if your WP website is responsive by simply shrinking the viewport of your browser (Ctrl+Shift+I). Or, you can use Google’s Device Mode. What you need to do: Ensure that your website performs well on different mobile devices to avoid being penalized by Google. 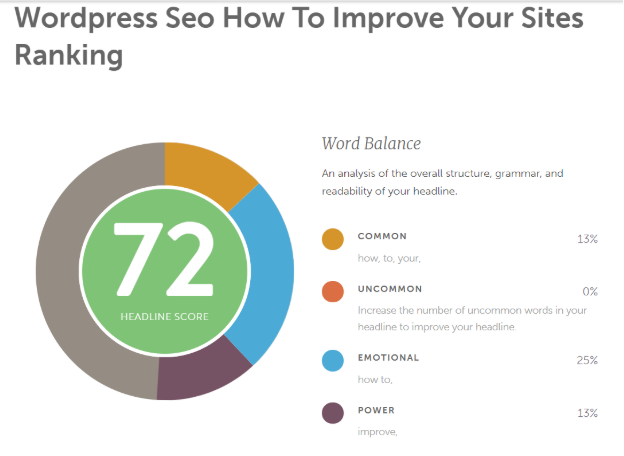 Optimizing your WordPress site won’t be a daunting task if you follow the action steps above. But it’s important to know that aside from tweaking your settings and using tools and plugins, you need to create quality content that will add value to your readers. Aside from that, SEO ranking factors are constantly changing. You have to be in the know of the latest updates in the Google algorithm to stay on top of the game. Georgi Todorov is a digital marketer. He recently started his own blog about digital marketing DigitalNovas. His passion is to help beginners to start and grow a successful online business. He has just launched his White Link Building Service. Hit him up on Linkedin or Twitter @GeorgiTodorovBG anytime.